Cancer is certainly Plan B. This surgery following her miracle in June was most certainly Plan B. Today was a big Plan B for the "B Team"! They had told us on Tuesday that they were going to move her to a rehab room instead of send her home to the apartment. In fact, they thought they would keep her there a week and work with her. We were all set for this plan and had made plans accordingly. Even special plans for celebrating Valentines Day in a special way! This all changed about 9:30 this morning when they informed us they were not going to have a bed available for several days on the rehab floor and so they were going to discharge us to go to another facility due to MD Anderson being above capacity, or we could go home with some assistance from home healthcare. We chose to go home. Dr Levenback hugged Kristi and she cried as she thanked him. In fact, we cried a few times today for many reasons! We all had to kick into high gear!! Kristi and I had lots of extra training and consultations, and Billy and Worley went shopping for all the supplies and equipment we would need! At 7:30 tonight we headed to our rented apartment nearby and drove as slow as possible to miss the full impact of any bumps! The day was chaotic and actually quite exhausting, but we chose to make the most of it. While the guys "wheeled" the huge load of contents of Kristi's room out to the car, I got Kristi ready for our "Joyful" victory lap and for Valentine's Evening by curling her hair and painting her nails while she put on some make-up! Jenny Anglin...Thanks for the bright pink polish. It was perfect! Billy and I helped her get dressed for the first time in 14 days too! We hugged many of the nurses goodbye and told them we were making a Victory Lap around the nurses pod that she walked around every night. They were all laughing and some clapping when they saw Kristi all fixed up! A couple nurses said they didn't even recognize her! I'm not sure they knew what to do with us, but some of them hugged and hugged on all four of us. One of Kristi's primary nurses who has been a nurse for 25 years, said she wished she could keep us forever. She said Kristi was such a delightful patient and that even though she had seen some supportive families, she had never seen anything like us. They told us they had been blessed by us. This was an answer to prayer for us! We have wanted to Glorify God and be a blessing! Kristi felt emotional as well because she was so grateful for these women who helped her get through some very rough and scary days. She went in wearing purple and came out wearing purple. Thank you Margo DeLong and Janice Hoffer for the purple robe! It was a perfect going home outfit! 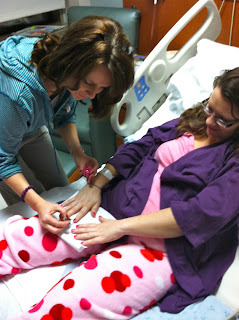 Kristi had several wonderful nurses and these were a few favorites that were on duty when we left. Kristi grew attached to them, and they to her. When Kristi was feeling well, she would ask them about their children and their life and show interest in them. WATCH THE VIDEO BELOW TO ENJOY KRISTI RINGING THE BELL OF ACCOMPLISHMENT! with Isaiah and Alyssa. Billy had told Kristi he would sleep at the hospital with her for Valentine's. Instead, she came home to sleep with him! 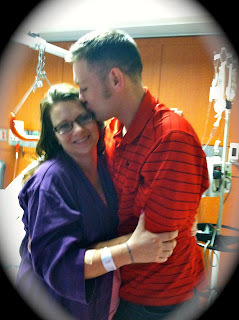 Please pray for us as we begin to really be Kristi's nursing staff full time now. Pray for Amy as she flies in tomorrow and Josh as he comes in on Monday to take their shift. Pray that we have no complications with the home healthcare. Pray for Leona, Katy and Charlotte at home as they help care for Isaiah and Alyssa. Pray against infection or complications every time you think of Kristi. Pray we will Glorify God and Bless Others! Man Plans His ways but God directs his steps! (Proverbs 16:9) No Plan B with God! Praying for a supa dupa rock star home health team, that they may be abundantly blessed with skillful knowledge and compassion. What a work out!!!!! 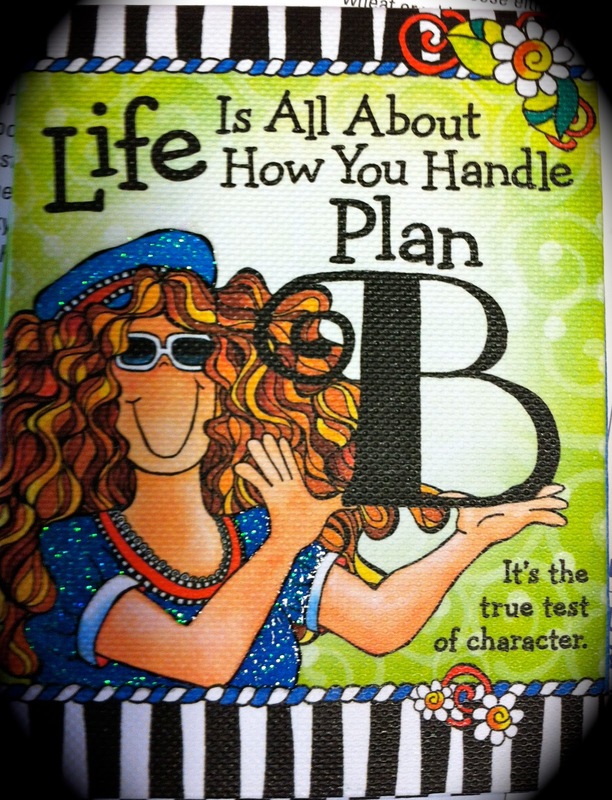 I like that about Plan B. We don't know what God has in store for us and so we plan and sometimes we have to replan as the Lord reveals His Plan one day or maybe one moment at a time. All I can say is WOW!!! You are all doing marvelous. How amazing! Prayers and Hugs! Much love. This is a very nice post Danina. Thank you. Loved the pictures on Valentines and our page. That was a very nice Valentine you did for Dad and I. We were pleasantly surprised. I sometimes think we get too much credit. We are very proud of you all as each one brings so much to this family and to others. You and your family continue to be wonderful witnesses to God's love, grace and glory.